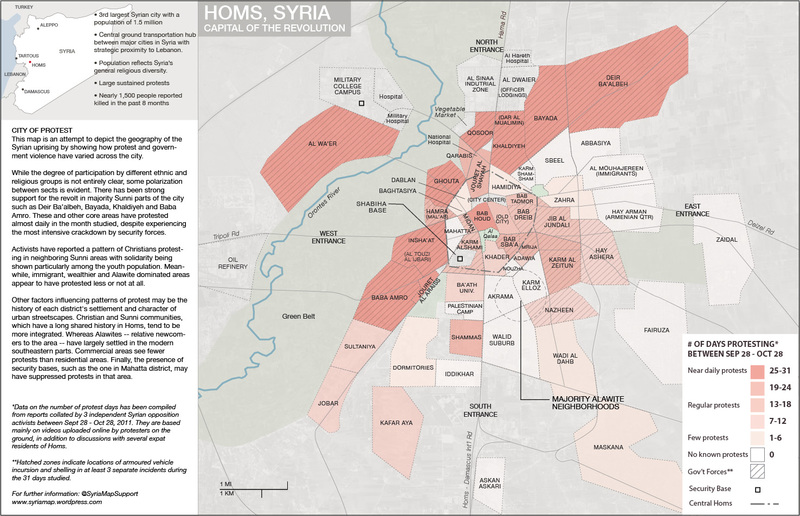 Following an 18-month siege by regime forces and weeks of intense clashes, al-Khalidiya neighborhood of Homs, which had been under the control of opposition fighters, was recaptured by the Syrian army on 28 July 2013. Syria’s third largest city, Homs had largely fallen off the international media’s radar since the early spring of 2012, when rebels lost a months-long battle for control of the Baba Amr neighborhood. Since July 2012, after opposition forces launched a campaign to capture Aleppo, foreign journalists entering Syria through Turkey have largely been converging on the northern city, as well as opposition-controlled areas in Idlib province. On July 27, after regime media announced that they had “secured” al-Khalidiya, aerial images surfaced which for the first time evinced the colossal scale of destruction. 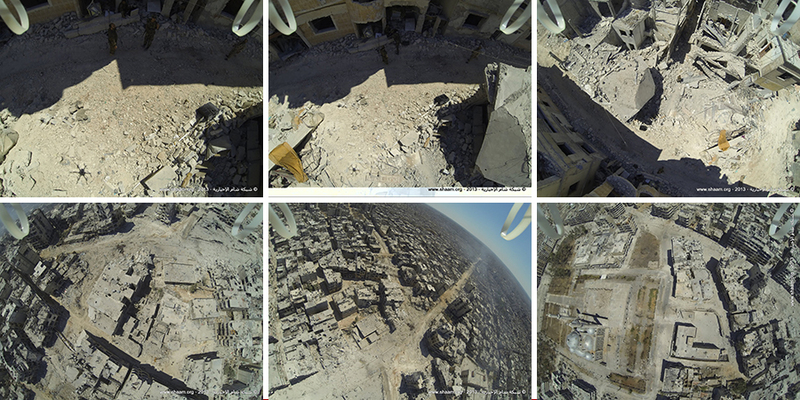 Throughout the siege, local photographers and photography collectives such as Lens of a Young Homsi have been uploading thousands of street-level images from Homs revealing entire blocks reduced to rubble. And a few days before al-Khalidiya fell to regime forces, images circulated on social media sites showing the eleventh century Khalid ibn al-Walid mosque billowing smoke and exhibiting extensive damage. But the aerial images, taken from an estimated height of 120 meters and capturing an area spanning at least 0.6 square kilometers, put those individual snapshots into perspective: as far as the eye can see, entire swaths of the city have been laid to waste. Dusty unpaved avenues, shell-pocked crumbling structures, not a soul in sight. The aerial shots were picked up by international news media and credited to AFP/Getty Images. But nowhere was any mention made of how and by whom these images were obtained. Did the regime take these photos and circulate them? Do opposition forces have airborne surveillance capabilities – commercial or otherwise? And which area are we in fact seeing? 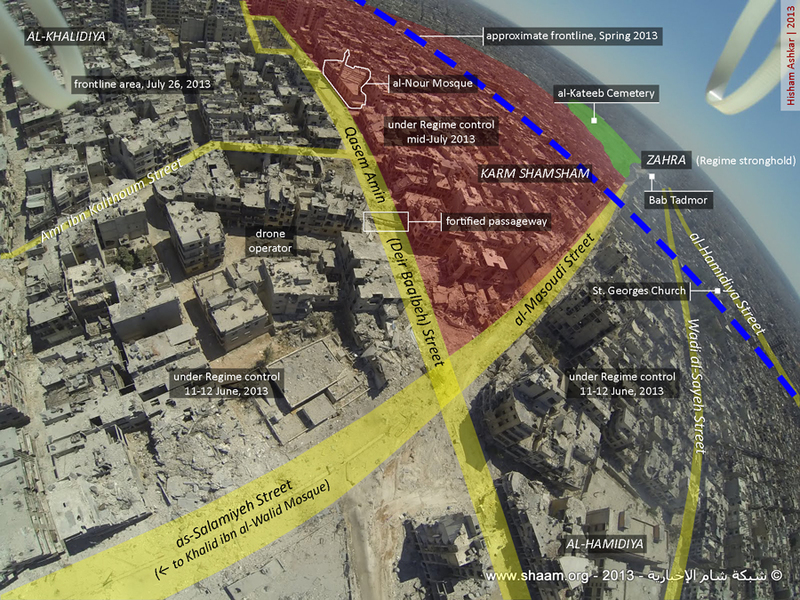 The aerial view purporting to show al-Khalidiya appears to have first been published on 27 July on the Facebook page of Bab al-Sbaa media center (a neighborhood south of the center of Homs), and later that day by al-Khalidiya Local Coordination Committee using the logo of Bab al-Sbaa media center. 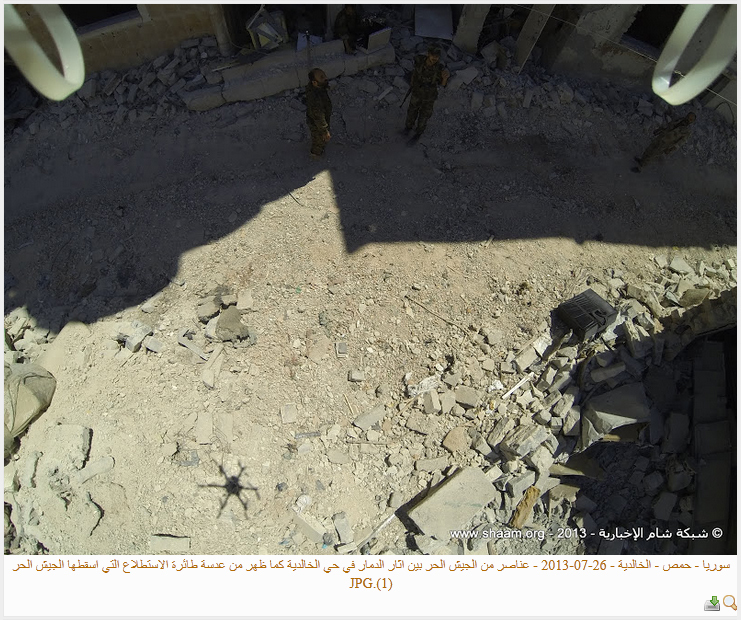 The captions on both pages state that the images are “from Homs” and were taken by the camera of a regime drone that had been downed by the Free Syrian Army. 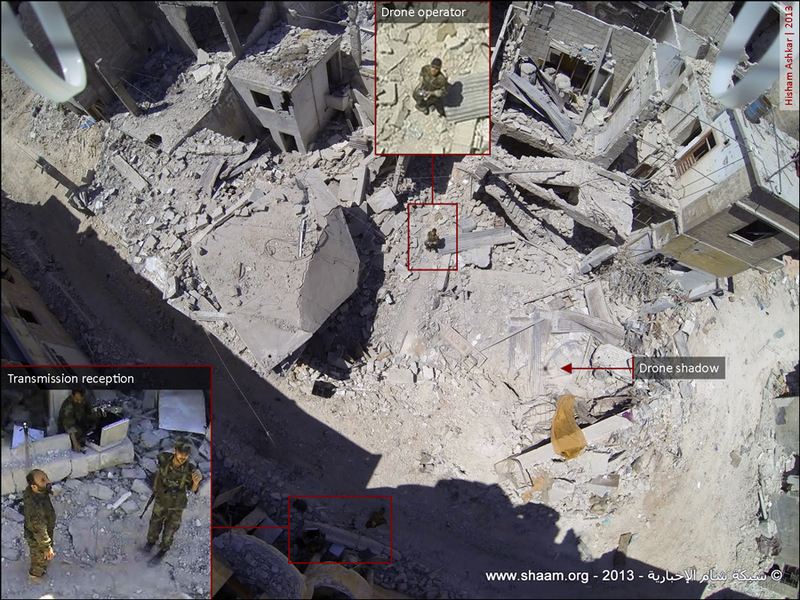 Two days later, on July 29, a different aerial shot of the same area was circulated by the opposition Shaam News Network (SNN) – part of a series of aerial images, some of them captured from a lower altitude that also reveal the shadow of a drone on the ground, as well as a number of men who appear to be looking up (and one man who appears to be operating it). The SNN caption states that the image specifically depict al-Khalidiya – the neighborhood that had just fallen to Assad forces. Three of these images from SNN, which is headquartered in the US, were picked up by AFP/Getty, water-stamped, and subsequently re-published by international media outlets. Most western media, including the the Daily Mail, the BBC, Libération, and the Independent, attributed the photo only to AFP/Getty; others, such as NBC news gave no credit at all. In its caption, the AFP did not include SNN’s claim that the images were taken from a downed regime drone. In fact, the AFP appears to have cropped the original shots without mention (as the digital alterations – cropping – do not appear in the images published by SNN). Which area are we seeing? These circulated aerial shots purport to show al-Khalidiya district. This is incorrect. 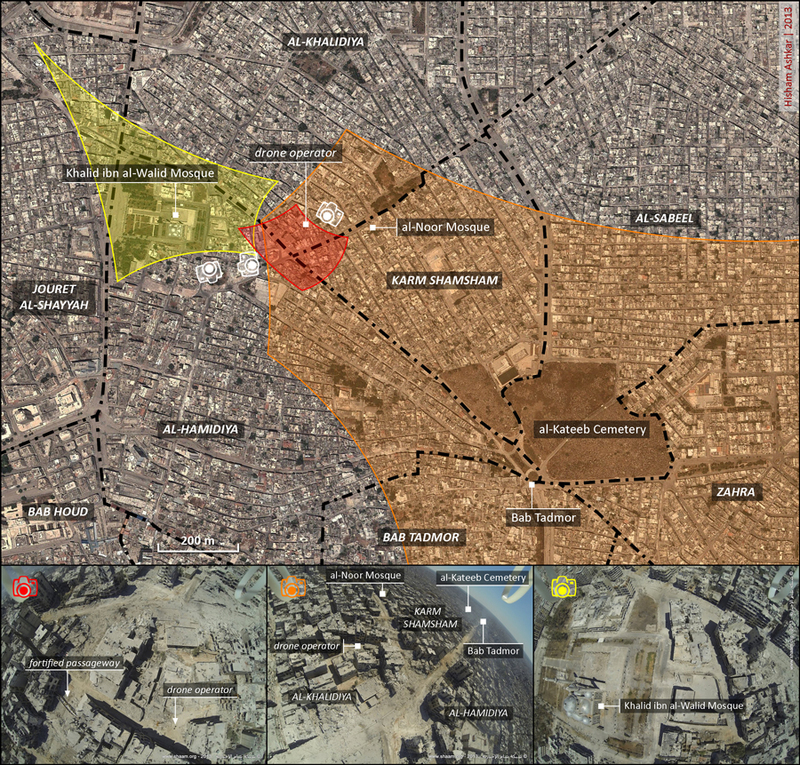 Most of the area seen in the aerial view is from the Karm Shamsham neighborhood, as detailed below. 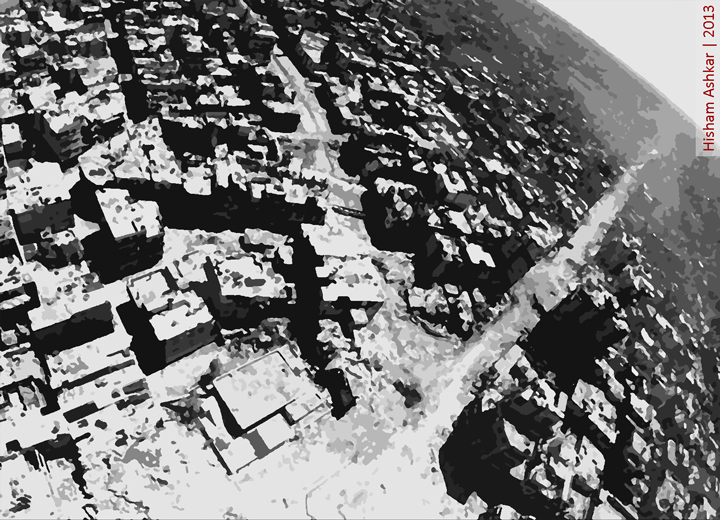 The distance between the drone’s position to Bab Tadmor seen above is approximately 900 meters, as the crow flies. Interestingly, the caption on the SNN photo also says that the men visible on the ground are FSA fighters. This would indicate that opposition fighters were operating the drone. But in a video uploaded on July 27 by Bab al-Sbaa media center – the group that first published the aerial images – an on-camera presenter claims that the men are Iranian operatives and shabiha (at 6:10- though no evidence is offered). A closer look – corroborated by both regime and opposition reports indicating that the Syrian army had taken over the depicted area well before July 26 – lead us to believe that the men are in fact uniformed Syrian army soldiers. One of them appears to be commanding the drone while the others are looking up. Another uniformed man visible on the bottom left hunched over a laptop may well be receiving a live feed of the images captured by the drone. Background: who was in control of the area? The drone operators are located at the edge of Karm Shamsham, next to the intersection of as-Salamiya and Qasem Amin Streets, an area that was taken by the Syrian army on June 11-12, according to the Lebanese daily an-Nahar, citing the opposition Syrian Observatory for Human Rights and the regime-affiliated al-Watan newspaper. For over a year, Karm Shamsham was the frontline in battles between opposition and regime forces: the western part was controlled by the rebels, while the eastern part (towards Zahra district – under regime control) was controlled by the Syrian army. As for al-Nour mosque and its surroundings, contradictory statements from pro-regime and pro-rebel sources were made on July 7-8 about who had won the battle around it. Dated July 16, this video from the opposition Karm Shamsham media center shows the mosque and states that it has been occupied by Assad’s forces. In the Bab al-Sbaa media center’s clip, as well as in a second video from the Commission for the Protection of Civilians (Hay’at Himayat al-Madaniyin), two men are seen displaying the downed commercial drone and attached camera from whence the images were taken. 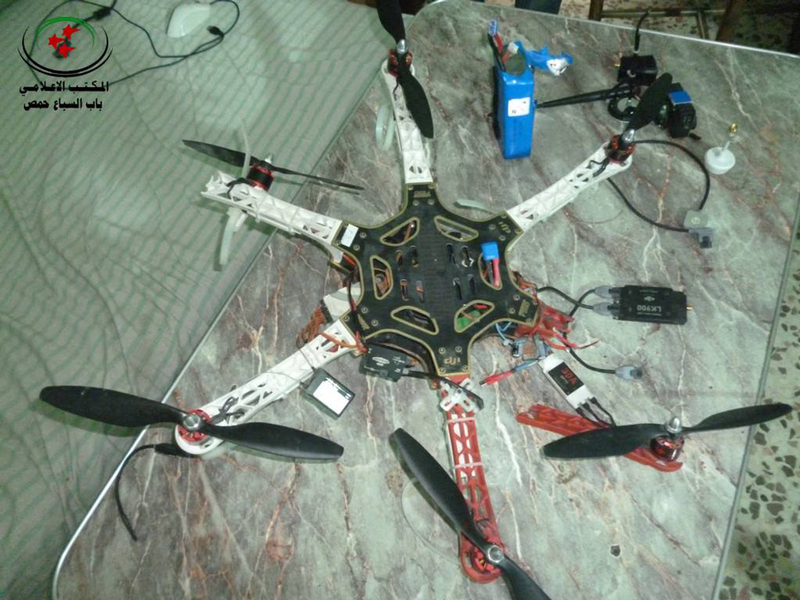 The presenter says the drone was shot down on July 26 in al-Khalidiya by the al-Ikhlas Brigade. In the second video, they mention that the drone is an F550 model (also visible on the drone’s shell at 1:26), and that it was downed by elements belonging to Hay’at Himayat al-Madaniyin (which al-Ikhlas is a part of, according to this document). On the drone controller equipment, one can make out that it is an LK900 ground controller station. The camera appears to be a GoPro HERO 3; the images were taken using a fisheye lens. The F550 is a commercial drone manufactured by DJI Innovations headquartered in Guangdong China (with a DJI America subsidiary based in Austin, Texas). The company describes itself as: “the global leader in developing & manufacturing high performance and easy-to-use small unmanned aerial systems for commercial and recreational use.” The starting cost for the drone, which can reach an altitude of 800 meters and remain airborne for 10 to 12 minutes, is $390 without the camera and transmission equipment. In a conflict where information is as heavily contested as Syria, photo agencies ought to investigate, verify and provide consumers with information about the origins of images, rather than opting for a generic disclaimer and surreptitiously cropping out indications of how an image was taken. When basic questions surrounding an image are left unanswered, the vast destruction of entire neighborhoods in Homs, which these images uniquely attest to, is rendered contestable. Furthermore, news media that re-publish images from photo agencies habitually obscure their origins by ignoring mandatory credit guidelines. Thus, the credits for unverified images that were picked up by photo agencies from anonymous activists are abbreviated, scrubbed of the original source and re-packaged, misleading viewers into believing the agencies themselves or official contractees supplied the image. Verification requires time and effort, but it mitigates uncertainty. A further murky element in the process of distributing images from Syria entails the widespread practice by western photo agencies of attributing photos to generic pseudonyms, without mentioning that these names aren’t real. While consumers might presume the practice a legitimate measure to protect the identities of local photographers, this is unlikely as the photographers’ names are obviously fake, as is the case with “Yazan al-Homsi” (Yazan of Homs) and “Thaer al-Khalidiya” (Revolutionary of al-Khalidiya) whose photos Reuters distributes. These names are credited in the standardized fashion (Agency/photographer’s name), without any indication that these pseudonyms are as generic as say, Michael of Jersey City or Revolutionary of Brooklyn. Critical audiences, particularly those already skeptical of western media narratives and the insufficient scrutiny with which material obtained from activists in Syria is handled, often presume that media (selectively) focus on or frame images of devastation. It is precisely for this reason that audiences would be well-served to know the actual scale of what they are seeing. Because it is that bad. 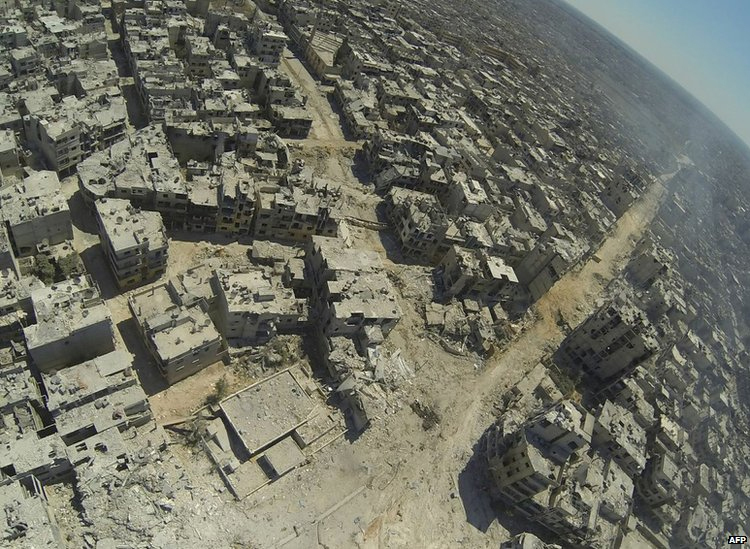 And the photos deserve to be viewed as undisputed testaments to Homs’ fate. 1. The Natural History of Destruction. The results of a Google image search for “similar images” to the Homs aerial shot returned a combination of scenes of wildlife and warfare. 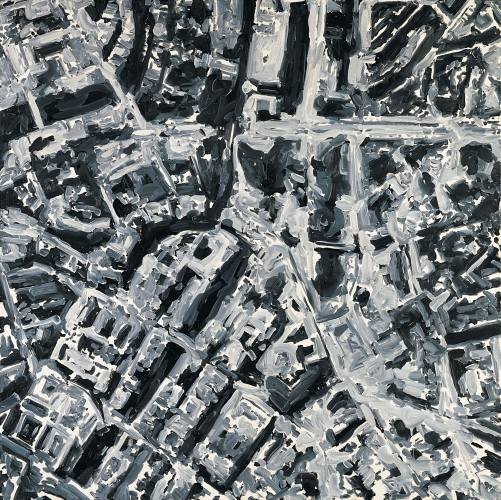 The aerial shot of Homs brought to mind German painter Gerhard Richter’s photorealistic paintings of cityscapes. Part of a series painted in the early 1970s, the ones rendered in lesser detail resemble aerial shots of destroyed cities. 1. ↑ And following the much publicized deaths of Sunday Times reporter Mary Colvin and French photographer Remi Ochlik, which further discouraged reporters from entering Homs. 2. ↑ This number was reached by comparing the approximate location (i.e. the bottom left hand corner of the aerial shot) to Google Earth imaging. Due to the angle of the camera and the fisheye lens effect, the altitude might be lower, closer to 100 m.
3. ↑ Note that al-Khalidiya is located to the north of the center of Homs. 4. ↑ District borders appearing in the map are an approximation. To identify districts borders in Homs, these documents A, B, C, D, and E were mainly used. 5. ↑ The area in question is Wadi al-Sayeh. According to this article, it is delimited by Karm Shamsham and al-Nour mosque to the east, Hama [Fares al-Khoury] street and Khalid ibn al-Walid Mosque to the west, al-Khalidiya to the north and north east, al-Hamidiya to the south, and Bab Tadmor to the south-east. Wadi al-Sayeh is the name of a street connecting Bab Tadmor roundabout to the vicinity of Khalid ibn al-Walid Mosque. Where is the “Hill of Shame” as used by the international media to report about the Gaza action of Israels army ? All the reporters were daily complaining and complaining, that “we cannot enter the Gaza strip”. They could, via Rafah. Now they complain again, we cannot enter Syria. They can, everywhere , because the border is not hermetically sealed off.